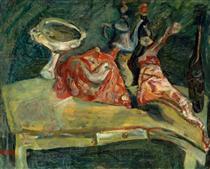 Soutine was born Chaim Sutin, in Smilavichy in the Minsk Governorate of the Russian Empire (present-day Belarus). He was the tenth of eleven children. 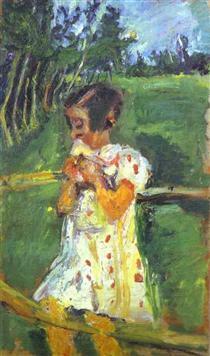 From 1910 to 1913 he studied in Vilnius at the Vilna Academy of Fine Arts. 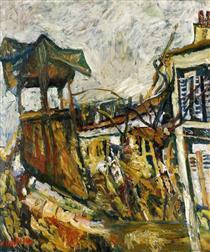 In 1913, with his friends Pinchus Kremegne (1890–1981) and Michel Kikoine (1892–1968), he emigrated to Paris, where he studied at the École des Beaux-Arts under Fernand Cormon. 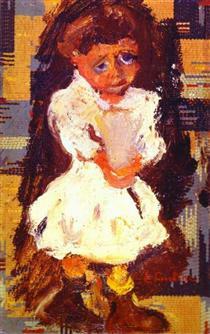 He soon developed a highly personal vision and painting technique. 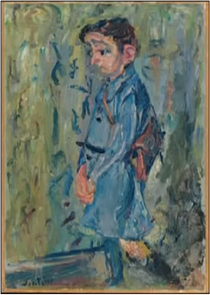 For a time, he and his friends lived at La Ruche, a residence for struggling artists in Montparnasse where he became friends with Amedeo Modigliani (1884–1920). 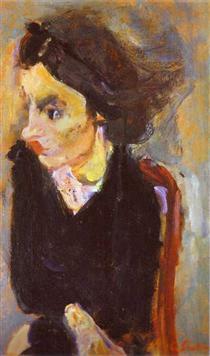 Modigliani painted Soutine's portrait several times, most famously in 1917, on a door of an apartment belonging to Léopold Zborowski (1889–1932), who was their art dealer. 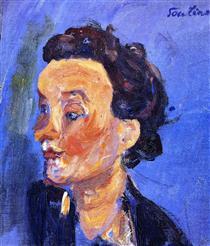 Zborowski supported Soutine through World War I, taking the struggling artist with him to Nice to escape the possible German invasion of Paris. 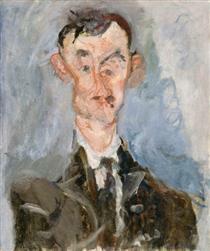 After the war Paul Guillaume, a highly influential art dealer, began to champion Soutine's work. 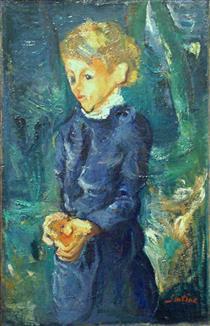 In 1923, in a showing arranged by Guillaume, the prominent American collector Albert C. Barnes (1872–1951), bought 60 of Soutine's paintings on the spot. 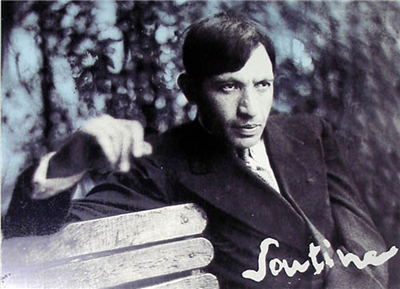 Soutine, who had been virtually penniless in his years in Paris, immediately took the money, ran into the street, hailed a Paris taxi, and ordered the driver to take him to Nice, on the French Riviera, more than 400 miles away. 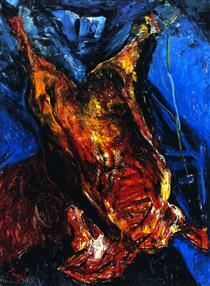 Soutine once horrified his neighbours by keeping an animal carcass in his studio so that he could paint it (Carcass of Beef). 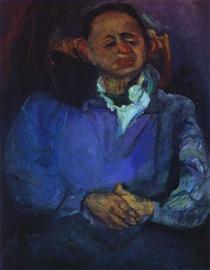 The stench drove them to send for the police, whom Soutine promptly lectured on the relative importance of art over hygiene. 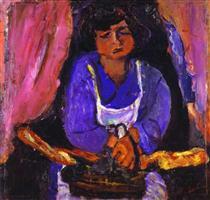 There's a story that Marc Chagall saw the blood from the carcass leak out onto the corridor outside Soutine's room, and rushed out screaming, 'Someone has killed Soutine.' 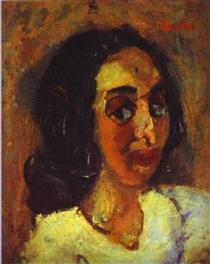 Soutine painted 10 works in this series, which have since become his most well-known. His carcass paintings were inspired by Rembrandt's still life of the same subject, Slaughtered Ox, which he discovered while studying the Old Masters in the Louvre. 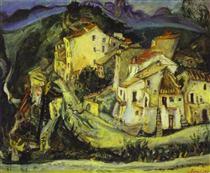 Soutine produced the majority of his works from 1920 to 1929. 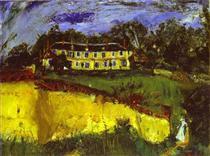 From 1930 to 1935, the interior designer Madeleine Castaing and her husband welcomed him to their summer home, the mansion of Lèves, becoming his patrons, so that Soutine could hold his first exhibition in Chicago in 1935. He seldom showed his works, but he did take part in the important exhibition The Origins and Development of International Independent Art held at the Galerie nationale du Jeu de Paume in 1937 in Paris, where he was at last hailed as a great painter. Soon afterwards France was invaded by German troops. 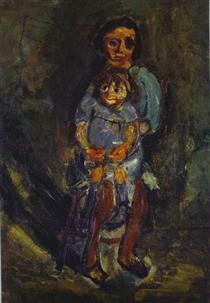 As a Jew, Soutine had to escape from the French capital and hide in order to avoid arrest by the Gestapo. He moved from one place to another and was sometimes forced to seek shelter in forests, sleeping outdoors. Suffering from a stomach ulcer and bleeding badly, he left a safe hiding place for Paris in order to undergo emergency surgery, which failed to save his life. 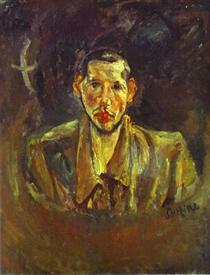 On August 9, 1943, Chaim Soutine died of a perforated ulcer. He was interred in Cimetière du Montparnasse, Paris.